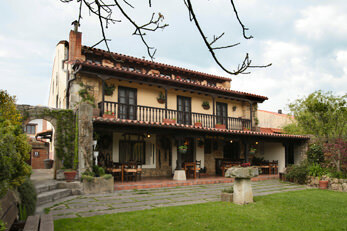 Mies de Villa, a typical old Cantabrian farmhouse, situated in the rural part of Somo, a small holiday resort within easy reach of Santander in the north of Spain. Mies de Villa greets you with its Arab tiled roof, thick stone walls and strong arches and within, the original oak beams reflect the strength and durability of the construction. 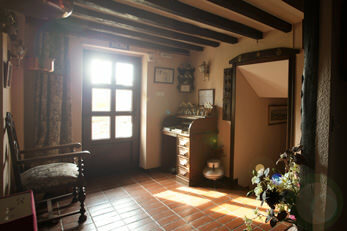 Mies de Villa was restored by its owners in 1991 using traditional materials, enhancing and combining rustic charm with all the homely comforts. 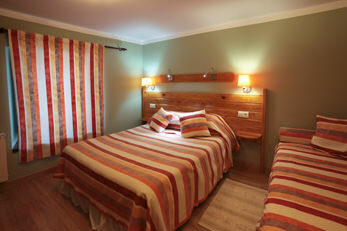 Each of the nine double or twin rooms has its own bathroom, heating, television and hairdryer. Mies de Villa offers the security of its spacious car park, the privacy of its luscious garden and the enchantment of its rustic porch where a delicious breakfast of home-made jams and hot buttered toast is served while one enjoys the panoramic views of the Cantabrian Mountains. And also the taste of our evening meals chosen from a selection off Tapas , salad, fish or meat , sweet ,coffe or tea.Also we are happy to say that we have a safe secure free parking on the premisses.